Our villa is located in the MW cape just a short drive from old Florida of Matlacha and pine island. Old Florida is the way it used to be with an outdoor lifestyle fishing, canoeing, bird watching, No crowds and no high rise buildings. Relax and watch beautiful sunsets over the lake. Furnished to the highest standards its modern contemporary design has been carefully planned out for your total comfort. As you would expect everything is already there for you from a fully equipped gourmet kitchen with carbon water system for pure water. Relax in the family room and watch TV on our 51 inch 4K roko TV with blu-ray for stunning picture quality. The master bedroom has a 40 inch TV with blu-ray. The queen bedroom also has a 40 inch TV roko. There is high speed wifi connection. The villa is fully air conditioned with humidity control. The liana has been exquisitely furnished with designer furniture with seating for 8. The fishing here is fantastic, with over 400 miles of fresh and salt water canals for cruising and fishing, including the Boca Grande World renowned for its tarpon fishing with many fish over the 100lb. The local burnt store marina being just a 10 minute drive away. Where you can launch your own boat or hire a local captain to take you fishing. The Boca grand is just 7 miles from the marina and with beautiful canals to explore the choice is endless. There are great local beaches and Sanibel and captive islands with their beautiful beaches are only a short drive away.Naples,the keys,and the everglades are just a few of the lovely places to visit. For any one looking for some retail therapy whilst in cape coral, there are many large stores and shopping outlets within easy reach. The villa, which is air conditioned has an open plan layout, with views over the pool and lake from the great room and the breakfast nook. The great room is furnished in a contemporary style and has a large 4K TV . The dining area has a beautiful walnut table and chairs. The large kitchen with its granite worktops, stainless steel appliances and central island unit also has a breakfast bar with low level pendent lighting. There is a large table and chair in the breakfast nook, off the kitchen. The cathedral ceilings throughout the main rooms create a lovely light, bright villa. There is also a large utility room with washer and dryer, and the double garage can be accessed from here. The master suite with its king size French style bed also overlooks the pool and lake, and has a beautiful en-suite room with a large walk-in shower and , with his and hers basins,Lovely mother of pearl mosaic tiling and black granite worktops. There is also a large walk-in dressing room. The pool can be accessed from this room via patio doors.a 40in sony hd with blu-ray . The second bedroom has a queen size bed,with a 40 inch tv with roko . fitted wardrobes and its own bathroom with walk in shower, also beautifully finished with mosaic tiling. Bedrooms three and four each have twin beds and fitted wardrobes. Bedroom three is decorated in a fresh blue and white colour scheme with white furniture. Bedroom four is decorated in a tropical style with furniture to match. There is a large bathroom ideally located between both rooms affording private access. This bathroom also has a walk in shower and is very contemporary in style. we have friends in the area and have been coming here for meny years so it was a natural progression to own our villa here ,we like the NW as it is a little more rual than the SW but still with loverly villas that are all new .we found our lott in coral oaks golf course which has stunning views over the lake to the west .also the beaches at sanibal ,captiva, are some of the best in the world. Our villa is the perfect location for your vacation with its tranquil setting in coral oaks golf course it is ideal for exploring this corner of Florida and the unspoiled beaches of Sanibel and Captiva Islands. Where shells and sharks teeth can be sifted out of the sand from the warm waters of the gulf of Mexico. Have a day exploring the Eco parks by canoe or kayak,with over 400 miles of canals, the wild life is amazing. Cape Coral is a boating and fishing paradise set on the shores of Charlotte harbor you have direct access to the Gulf of Mexico. Burnt store marina is just 10 minutes from the villa by car, Where you can hire boats or a captain to take you fishing or even launch your own boat. On the cultural side there are theaters, museums and art galleries to visit from Pine Island down To Naples. Our villa is situated in the south west coast which allows you to explore Florida. Disney parks are only 3hrs away, the everglades are only 1 hr or Miami is 2.5 hrs away. Upon arrival our first impression was WOW and it remained that way for the 3 weeksxwexwere there. Our stay was wonderful and the villa allowed us to entertain a number of family very comfortably. Everyone was impressed. Spacious layout for everyone allowing enough privacy as needed. The lanai and pool were fabulous again with substantial space. The view from the infinity pool overlooking the golf course was incredible. We were able to walk in the neighborhood and were close enough to drive to beaches, outlets, golf courses and amenities were close by. Highly recommend this villa. Pulling up in front of the house then going inside it was what was shown on the website. The living and dining were wide open. The street the house was on was very quiet there was no traffic noise. The pool area was large and the pool was clean sitting out there you could watch the golfers or the fish in the pond. There were also ducks and other species of birds there also. The master bedroom was huge with a large master bath. There are a lot of good places to eat and places to shop not to far away. I would rent there again if I vacation in that area. From the time you enter the front door you are immediately transported to a place of peace and comfort. It goes without saying that the sunset views are outstanding, but that was not what made staying here so wonderful. The home is simply decorated and not clutterer so there is an openness that makes you feel connected to all part of the house and yet you can close the door to the master suite and be in your own private world. Other things we enjoyed was how well the kitchen and laundry room were stocked. You can walk right in and feel at home. Communication with the owner and caretaker was easy as they were quite responsive. The location of the house generally required at 15+ minute drive to most shops & resturants. We both thank you for your review and that you enjoyed your vacation so much at our villa .Debbie and I hope that you will return in the future . Enjoyed our vacation at this villa! Never fails to impress us! The house is spacious and clean and had everything we needed. The view of the golf course is beautiful, we loved watching the sun set every night and if we had gone out for the day we would try to make it back in time for that. We spent as much time on the lanai as we could just enjoying the sunshine and fresh air, and had most of our meals there. We loved hearing all the birds and spotting the occasional turtle or fish in the pond, and had fun watching the golfers on the other side. There is a gorgeous bougainvillea in the front of the house that was in full bloom while we were there. We have already reserved a week for next year. 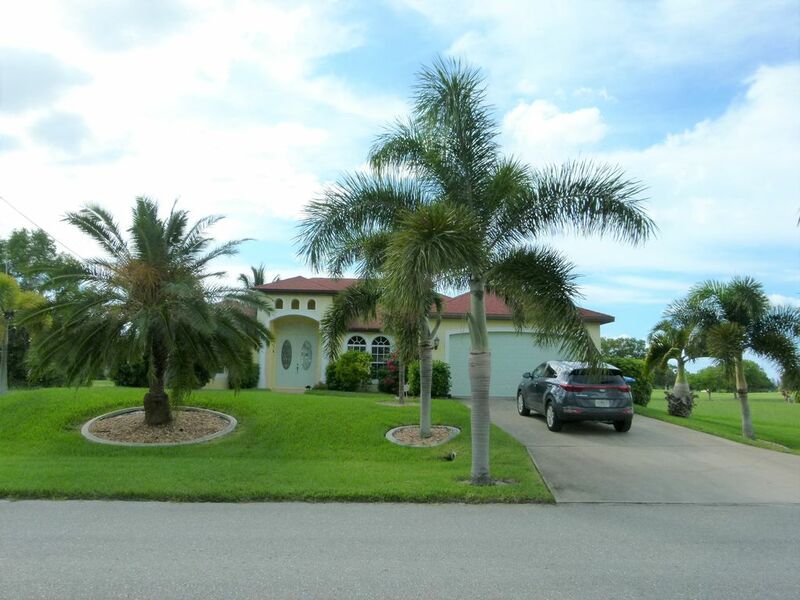 Our villa is located in the north west of cape coral which is a semi rural area with new large luxurious villas. There is a gas station /store located on burnt store road about one mile from the villa. and on the junction of pine island road and burnt store road you will find a public food store with post office.video store,hair dresser, Further down pine island road you will find several restaurants and local bars.a ten minute drive up burnt store rd you will find burnt store marina ,which has an excellent restaurant and a bar with live entertainment. boat hire is only ten minutes from the villa with direct access to charlott harbour and 15minutes to the gulf of mexico. Golf: Coral Oaks golf course is one of the most challenging 72 par courses in Lee County. Our villa is located along side the third tee with only a ten minute stroll to the club house. The rates are very competitive and visitors are made very welcome and if you are on your own they will pair you up with other golfers. There are resident pros and if you want some help in improving your game they can be booked. Or if you are a novice, lessons can also be booked. Royal Tee golf course is about a ten minute drive and is located on pine island road. - All prices do not include vat (6%) and city tax (5%) - A deposit of $400.00 is required with booking confirmation. The total balance payable is required 30 days prior to arrival. The security deposit of $400.00 will be refunded within two weeks of departure and inspection. All electrical usage is included within the price including pool heating.